The attempts to link the San Bernardino jihadists to conservatives is pretty much done now. Hey it's not like they didn't try though. Now, the left is simply trying to claim some form of hybrid workplace/jihadi thing. I don't even know what that means considering the couple's ties to terror and the fact that their garage was an armory. But boy did the media try. CNN seemed desperate to pin the killings on the right wing, according to Newsbusters. The news channel hosted former FBI official Tom Fuentes who said that he believed that “an anti-government domestic militia group” was responsible despite having zero information other than that there was violence taking place so it must be conservatives. CNN law enforcement analyst Harry Houck told Erin Burnett that the perpetrators “could be some right-wing group, for all I know." Seems like a jump to make when you're essentially trying to say "I don't know." Well it appears to be a kind of hybrid workplace jihad. He targeted his coworkers, but he also recently raveled to Saudi Arabia. On his website [a dating profile] he appears to be an all-American boy, he enjoyed snowboarding, working on cars, and guns , he was very comfortable with the gun culture. Comfortable with gun culture? What? 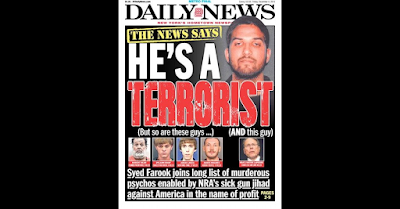 Just an all-American boy comfortable with the gun culture and...oh yeah, he went to Saudi Arabia. But the focus on pro-lifers as possible perpetrators was particularly intense. So let's get this right. MSNBC heard there was a shooting and immediately called Planned Parenthood to see if they were ok and still aborting babies. Priorities, huh? But think about that, MSNBC hears there's a shooting and they think pro-lifers. What kind of demented weirdos are they? Let me inform you CNN punks of something. When there's a mass shooting, normal people don't think pro-lifers. I know you do but I said normal people. Normal people question if it's terrorism but you're too twisted by the leftist agenda to have anything close to a normal reaction. This is just crazytown. Expect the media to move fast away from this story while they attempt to hold on to the confusing "hybrid workplace jihad" thing they're trying to make an actual thing. That's like calling 9-11 a "hybrid airline jihad." It's jihad. Plain and simple. 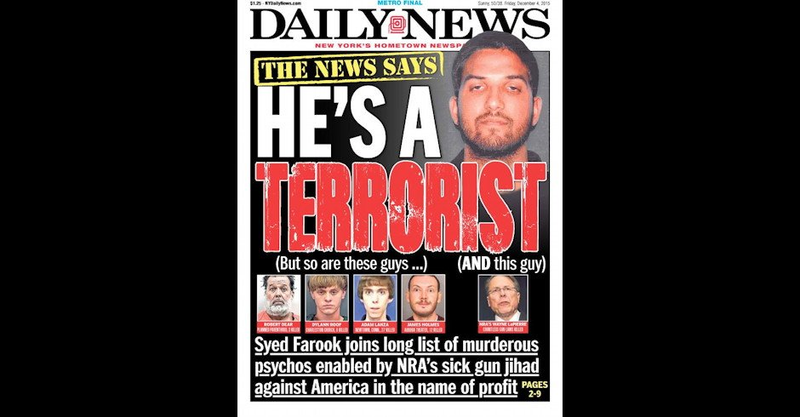 Update: And now this from The Daily News, equating the NRA with terror. Wow. Doubling down on stupid, huh? And they wonder why circulation plummets.